New players in the true wireless earbuds space tend to be a little more aggressive with marketing, which is exactly how AxumGear is taking its approach as a newcomer. 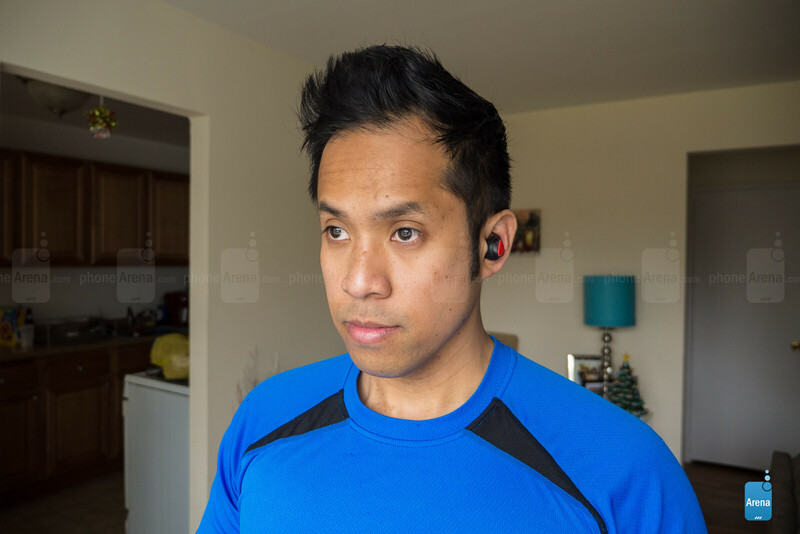 For its first-time endeavor, the AxumGear Sports Earbuds seem like a solid package, going as far as being touted as "the world's best workout earbuds." Of course, there's a ton of expectations behind such a bold statement, and we're crossing our fingers that these don't disappoint! 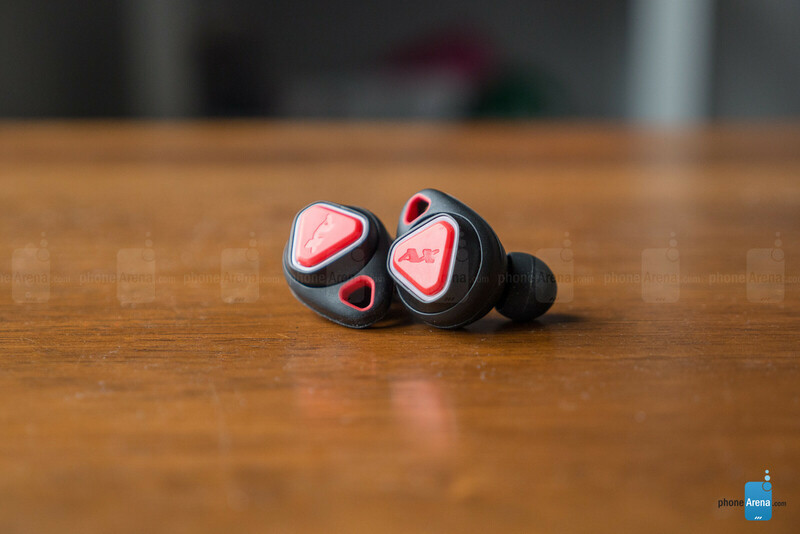 Superficially, the AxumGear Sports Earbuds leverage the conventional style that is all too common in the space and have a similar footprint to that of earbuds like the Samsung Gear IconX. 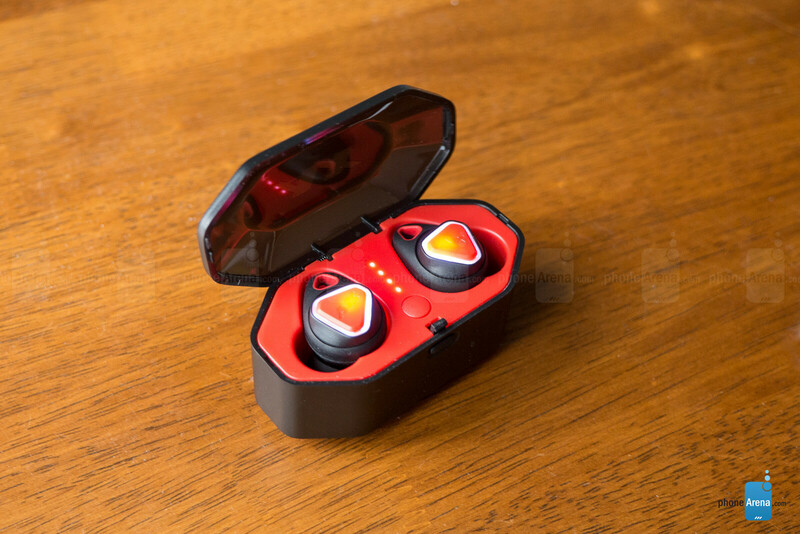 But the piercing red color of the earbuds and the red-accented triangular cutouts with the AxumGear logo manage to evoke a subtle aggressive undertone. We dig it. Interestingly enough, AxumGear markets the earbuds with a "never fall" design, which we have to admit is an accurate description. Unlike its contemporaries, they're paired with extra thick silicone hooks that provide a fit that's really unbreakable when combined with the set's silicone ear tips. We put them through a solid gym session that had us moving vigorously and sweating, and even through all that, they remained firmly in our ear. 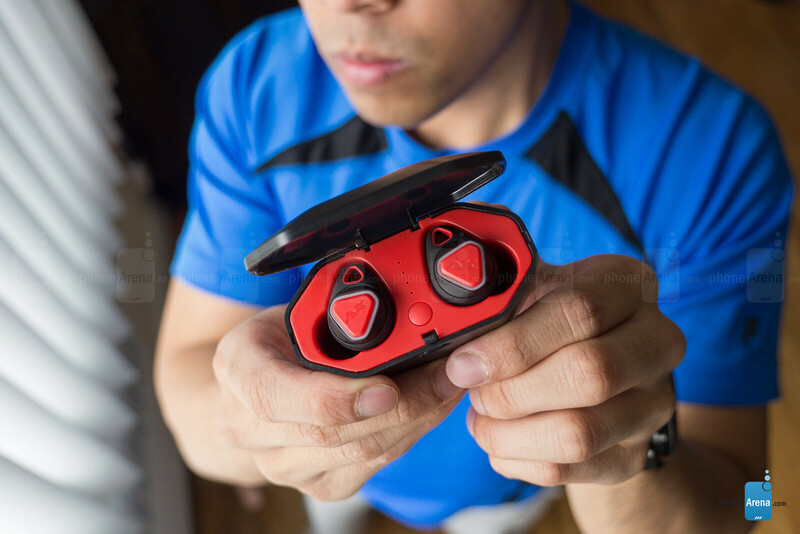 Even better, the earbuds feature a water-resistant construction, which will more than endure those sweaty workouts. Just don't think about submerging them in the pool. Going with the conventional route, there's nothing out of the ordinary with the included battery charging case. It functions as a case to store the earbuds when they're not being used while actively charging them. There doesn't seem to be a magnetic connection with them, so you'll want to be mindful to have the charging pins lined up accordingly – or risk taking the buds out later to realize they weren't charged. In order to pair the earbuds for the first time, we're required to long-press the multi-function button on the left earbud for approximately 5 seconds, which places it into pairing mode. 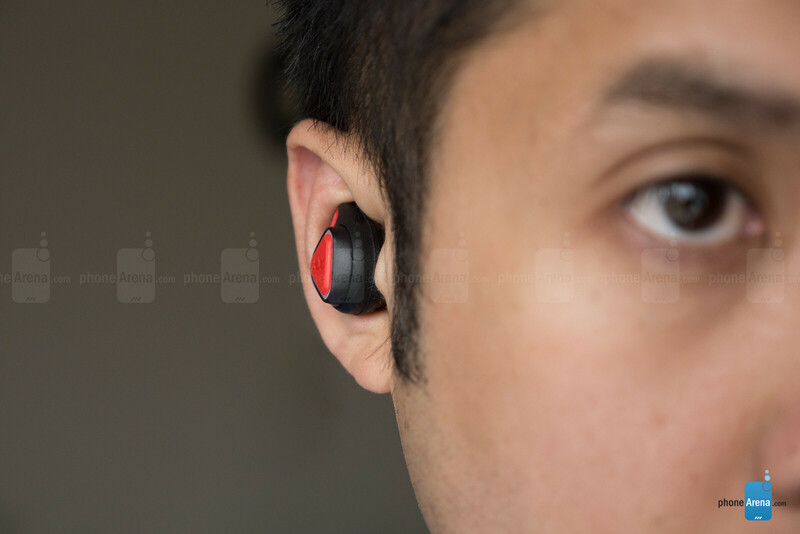 After pairing it to an LG V30, we then proceeded to turn on the right earbud which connected to the left earbud automatically. Now, it would've been great if the earbuds automatically turned on and connected after taking them out of the case, but instead, it's a manual process. There's no additional app to download when using the AxumGear Sports Earbuds, so they leverage your phone's native controls. As for some additional features, it's quite shocking that there's nothing else to be found with them. That's seriously disappointing, just because for something slapped with an MSRP of $299, we were expecting much more than just your baseline pair of true wireless earbuds. When it comes to built-in controls, there are only two functions available when using either multi-function button – pause/play and track reverse. Pressing on the multi-function button achieves the former, while double pressing it initiates the latter. Everything else, however, you'll need to rely on your connected mobile device, which also includes volume adjustment. 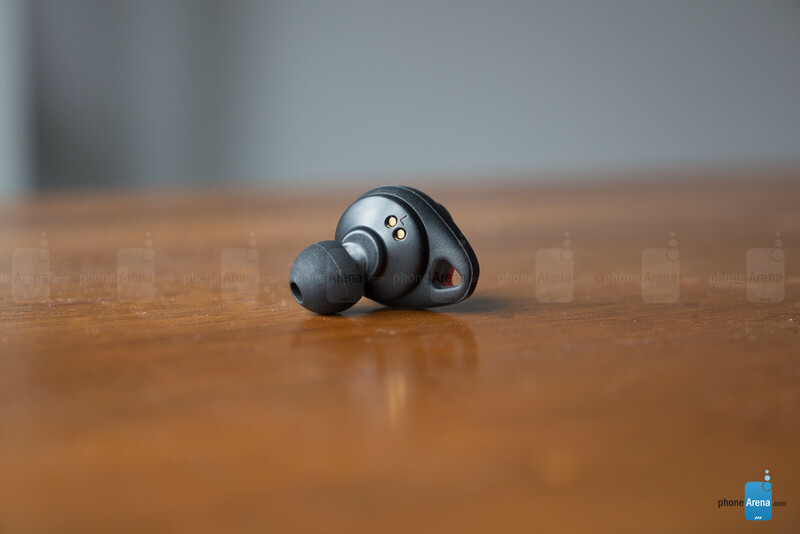 "Unbreakable Ultra Strong Signal powered by Qualcomm" – that's how the AxumGear Sports Earbuds are being marketed, which is ironic given their disastrous connectivity performance. Seriously, it's initially annoying when you're working out at the gym and the music is consistently going in-and-out, but then after 30 minutes of the same repetition, it comes infuriating. Unfortunately for this pair, the poor connection, line of sight requirement, and weak range renders it useless unless you're just sitting still and not moving all that much. If that's not enough to dissuade users from using them, the Bluetooth 4.1 connection with the earbuds causes some serious latency issues when it comes to watching video. There's a delay with the audio being transmitted to the earbuds, so voices are never in sync to what you're watching on video. Infuriating as well? You betcha. Under the hood, the AxumGear Sports Earbuds are packing custom 8mm dynamic drivers. They have an affinity for audio in the lower ranges, which is made more poignant with the amount of bass that accompanies each drum beat. While not as overpowering as what we experienced with the ERL Total Wireless Earbuds recently, it doesn't overwhelm the mids and highs as much – albeit, they're a little bit on the flat side. Unfortunately, there's a slight hissy tone in the background that we can make out, as well as some audible radio interference noise. While it's not really noticeable when you're listening to music on the middle to high volume levels, it is when music is paused or stopped. As for ambient noise suppression, the silicone ear tips do a decent job in blocking it out, but the foam ear tips are better. We achieved just a little under 3 hours from a full charge with our real-world mixed usage, but it's still close to its rating of 3 hours. Compared to its rivals in the field, this set of earbuds is considerably short, so don't expect longevity out of this set. Thankfully, the battery charging case is rated to offer an additional 6 charges. When you're looking to make a name for yourself, especially being a newcomer, you know that you have to hit it out of the ballpark on your first shot. 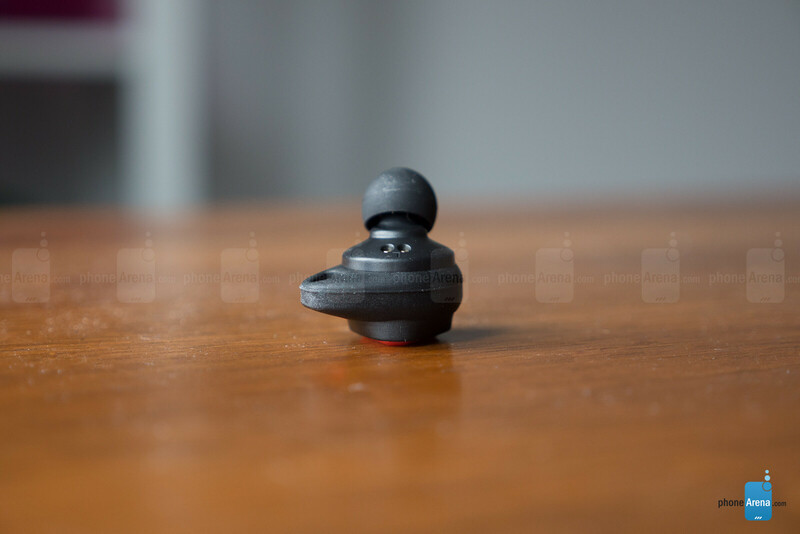 Sadly, the AxumGear Sports Earbuds fails to deliver the most fundamental expectation we want from a pair of true wireless earbuds. And that's having a stable connection. Due to this failure, it's nearly impossible to take this as a serious contender in the space – more so when it's attached with an MSRP of $299. Sure, you can snag them right now for $189.00 as a special introductory price, but even then, it's unfathomable for this to compete against other established offerings at the same price point. $299 ? I thought these were $39 or so. Delivery is lousy. Customer service is worst. Finally got mine after years. Connection is not as good as it claims. Phone call is bad, other person could not hear what is said (sound like in space and always broken in connection). Audio sound is ok but constant right ear could not be heard. Comfortability is not too good (too big using their regular ring and lost the sound when moving around since could not deliver the sound to the ear canal). I made an account just for this and I'm not the type of person to bad mouth something unless it is atrocious. These are junk do not buy. They will not connect to each other within the first week and will always be out of sync. I've had them for about 60 days and the right one is has lost 90% of its sound output. The left has probably lost 20%. Its so bad now I'm just gonna throw them away. One of the worst purchases of all time so I'll give you all a fair warning I thought these were gonna be awesome and they were first day or two but now I feel like I took $150 and lit it on fire and you will too if you buy this junk.